Once we got home and I’d hosed down (sorry, bathed) the children we had a look through my card making stash. William likes to be involved in the design and suggested a balloon too. A squirrel holding a balloon? OK, go on then. Luckily I had one on the Stretch Your Imagination cartridge, and I used the Type Candy cartridge to cut the number. I also had some acorn patterned paper that had been free in a magazine years ago which helped to inspire my card colour choices. It was quite a quick make, all I did was assemble the layers of squirrel, mat the paper on to some contrasting card and organise the images to William’s satisfaction. I used baker’s twine to attach the balloon to the squirrel but sadly it untwisted slightly overnight. It’s not too bad, just not as neat as it looked when I first did it. The balloon is stuck down with 3D foam tape for a little bit of depth. What do you think? I quite like the little squirrel (which has his/her hands very full with an acorn and a balloon, whoops!) I don’t always use the seasons for birthday cards but it was a good excuse to use my favourite Cricut cartridge and the cute acorn papers all in one go! Thank you, we’ve been trying to make the most of any good weather. That squirrel sure is cute. I love this little critter – I think the eyelashes do it! Super card. What is a PITA? I googled, but only found the bread…. Pain in the …. (My Cricut is a bit temperamental and could probably do with a new blade and/or an owner who knows what she’s doing!) I had to try and finish the cutting with a craft knife. Lol! I love that. The expression, not your Cricut trauma. Thanks for the enlightenment! You’re welcome, glad to be of service! Cricut blades are not very exciting things to buy when there are so many pretty this out there and I keep putting it off. One day I will get some. Squirrels are a great choice for children 🙂 Happy birthday to your sweet niece! Ooooh what a lovely card! I love the the scheme and the squirrel is so pretty. It’s lovely that William likes to get involved! Adorable little squirrel- eyelashes and all! 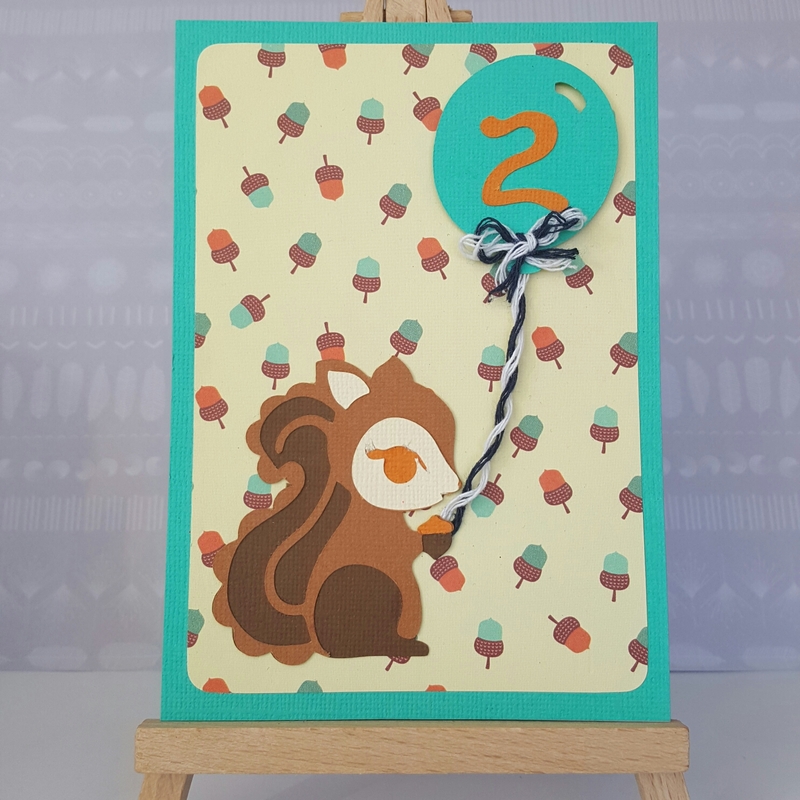 I missed this post somehow… I do like this squirrel and patterned paper is a perfect match! At first I thought, that you’ve made and adhered all these acorns! Lol We have so many squirrels in our area, that I easily imagine them with balloons or even eating cake! You couldn’t go wrong with such a cute card! I think creating cards for children is more tricky, than for adults!